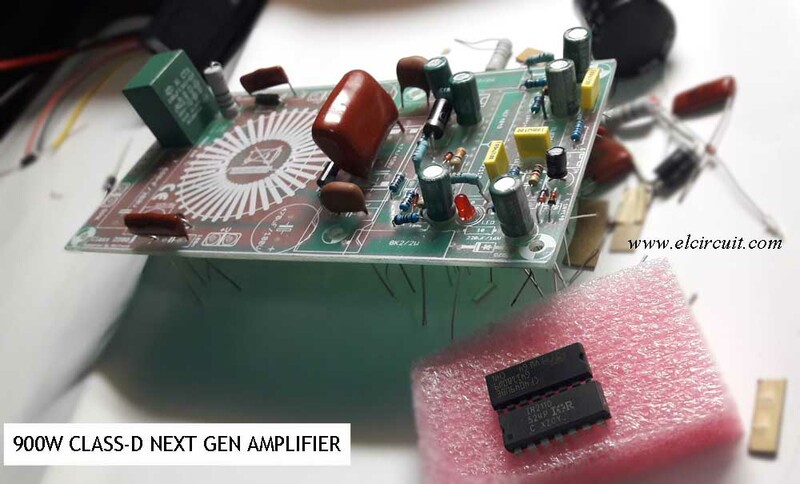 In the last decade, in the world of audio power amplifiers have been available commercial products for audio.A new type amplifier that is Class-D Amplifier. Unlike the Class-A, B, AB, in which the incoming signal directly, is amplified in the form of the original sound signal, in Class-D Amplifier, a sound signal counting is performed enter but still in analog method, the signal strengthened. At the end level (final stage) of the amplifier, the signal is returned to sound signals by using the inductor-capacitor (L-C) filter. There are many designs of Class-D Amplifier schemes that can be found on the internet. This time that will be discussed in this paper is Self Oscillating Cass-D Amplifier IRS-900D. This scheme circulates on the internet, and is pretty good, can be implemented and has an output capability of up to 900 Watt at 4 ohms, a considerable capability. To create a good Class-D and high quality is required good component quality and layout PCB appropriate for high-frequency switching. However, for this limitation, it can not produce the quality that meets industry criteria but is still very satisfying when compared to Class-AB class assemblies sold in the market. Here is a scheme that applies the design and concept of class D. This scheme has been modified by the author Kartino Surodipo to be more reliable and safe. The red color values below are replacements of the original schema values and there may be no paths on the PCB. So it should be soldered under PCB. The above circuit uses +/- 100V DC power supply. Besides, a separate 12 Volt power supply is required to drive the IR2110 IC gate driver. The consideration made separately is because it will further simplify the scheme. With the above series, suitable for allotment from the subwoofer to mid-hi. This designation is not disappointing, considering that in the market the 900 Watt assembly kit is generally reserved for Subwoofer applications until Mid-Hi. Modifications can be made to improve performance. For example by increasing the oscillation frequency capability. In Class-d self-oscillation, the oscillation frequency velocity is determined by the on-off speed effect of the closed loop feedback which involves the entire component in the feedback loop. Improvement can be done by replacing OP Amp comparator with higher capabilities, eg from Burr-Brown. And the main one is the mosfet power, which can be selected by the product with low gate capacitance from IXYS or IRFP4227, or IRFB4227, or other brands with more advanced generation. To note is the smallest gate capacitance and the highest switching speed, and of course the big SOA. 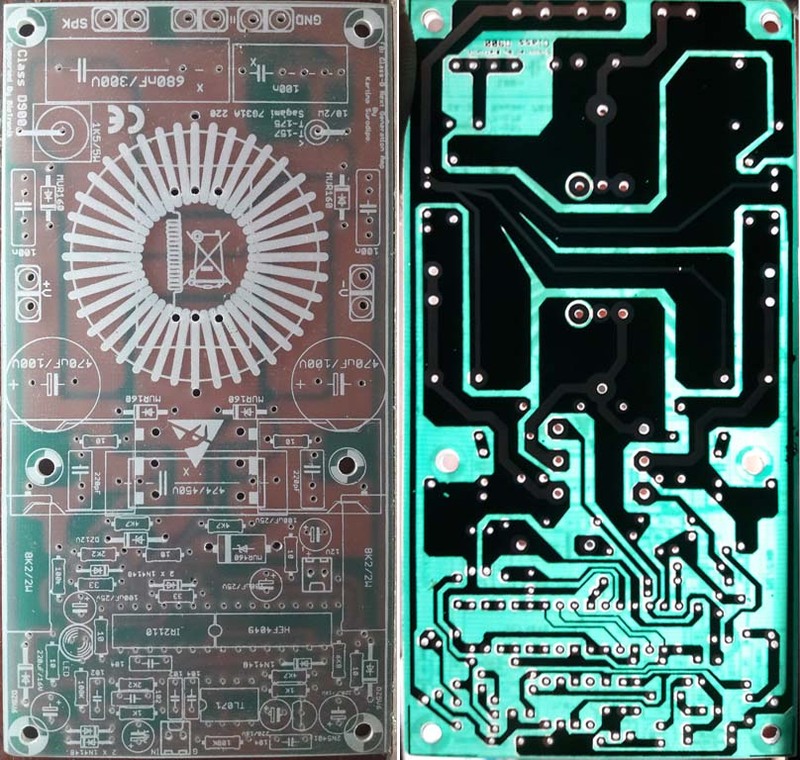 Here's a little explanation of the class D amplifier and also for the scheme and PCB Power Amplifier 900W class D. PCB you can buy on the link contained in the post. 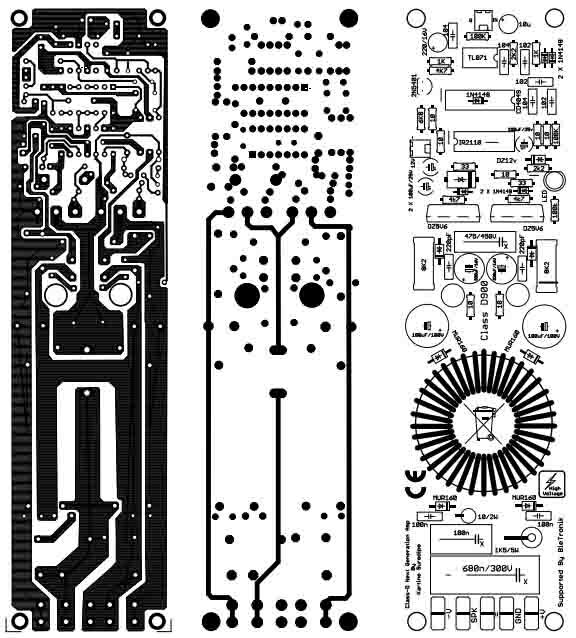 PCB made by original Mr. Kartino Surodipo. For the next post, I will share the installation and try the quality and power of this D-class power amplifier. Super Amplifier, do you have a tested video. If you have please share sir. the video updated soon.. so please wait. did you make this class d amp working properly? yes, is the most powerful next generatin power amplifier. I have tested 200w class d amp. and so i will make the class d greater power than 200w. Sorry for missing the part list, wait untikl im update it. There is no PDF for this amp, see d1k5 power amplifier in newest post. How do I get the diagram? Sir please help,My core 47mm×24mm×17mm yellow/white,1.5mm wire turn-12,but Verry heating, how much turn ? Please sir help my yellow/white core47mm×24mm×17mm,but how turn?